There’s one thing I cannot resist and that is making my accessories more bookish. One accessory that I have an issue with that is my phone – I never want to spend SO much money on a phone case but I want something that looks adorable, is functional and practical as well. And the Once Upon a Bookcase magically appeared and this box has instantly become a favorite. Once Upon a Bookcase had it’s first month this October, and I was lucky enough to snag a box. The company is owned by Chick Lit Designs and features the BEAUTIFUL phone cases you can purchase in her etsy store, for a great deal. The shop is owned by Michelle and she is amazing at what she does – her designs are gorgeous but I cannot justify spending $30 on a phone case, plus shipping – for me it’s just unreasonable. She came up with Once Upon a Bookcase and I fell in love with the idea. For $26 a month, plus shipping, this subscription box includes a new phone case and 2-3 beautiful, themed goodies to go along with it. And this month? What a flawless start to this new company. Michelle offers 3 options – a Girly Girl box (featuring some more feminine looking designs monthly), a Manly Man box (featuring some more masculine looking designs monthly), and an Anything & Everything box (which varies from month to month with girly and manly designs). I am subscribed to the Anything & Everything box because all the designs are absolutely beautiful and I couldn’t complain no matter which I got and this month I didn’t complain at all. 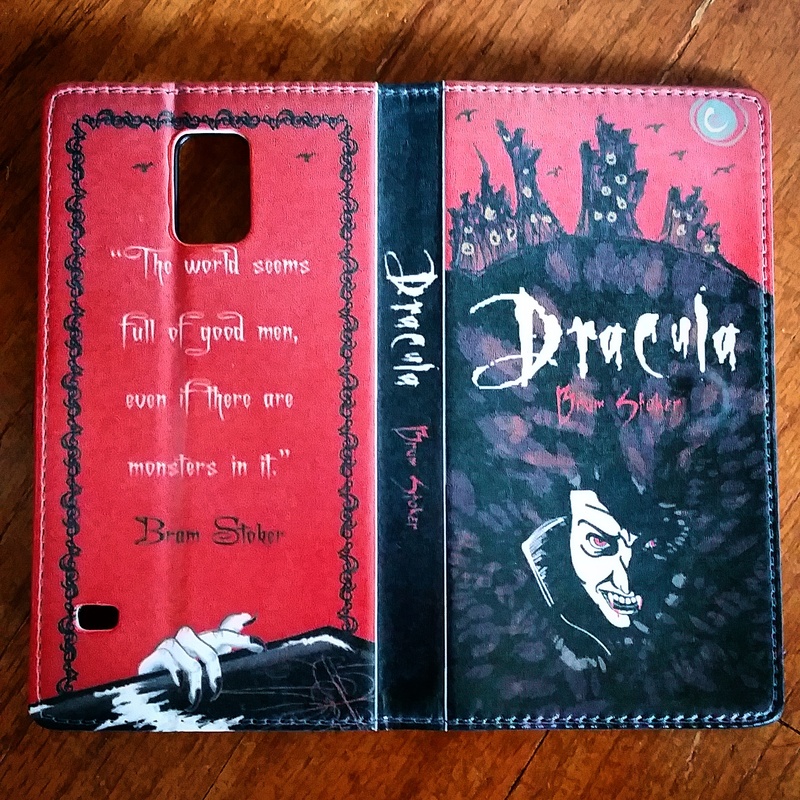 The case is absolutely gorgeous, and fits my phone (a Samsung Galaxy s5) perfectly. She also offers the cases in a variety of phone styles, so check to see if she does yours! There are also 3 credit card slots and a money pocket on the inside for all your necessary goodies to make a quick getaway from ghouls, ghosts and vampires! 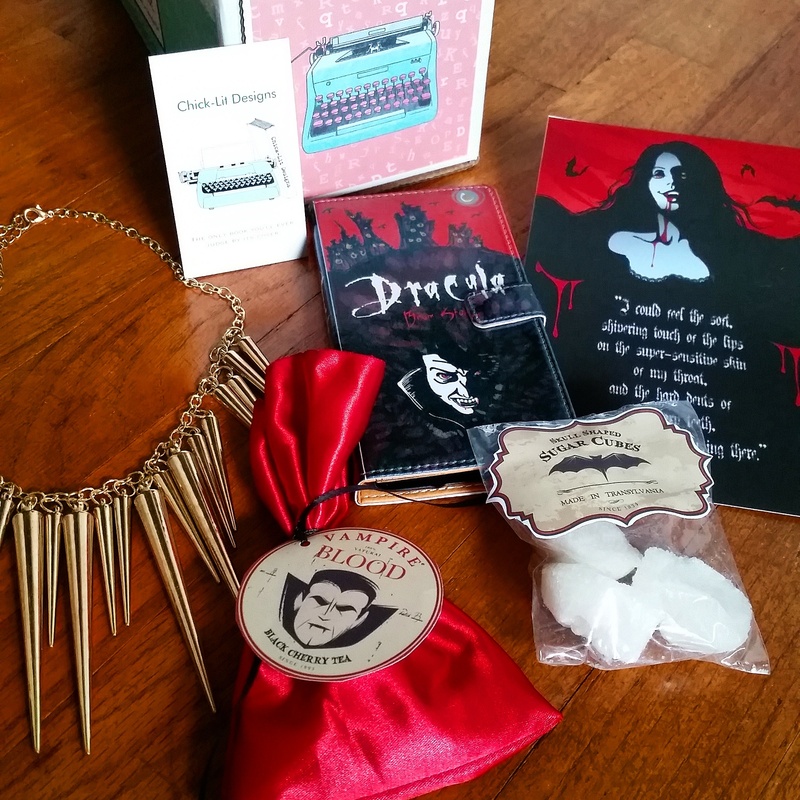 And then came the goodies – which blew me away. I had no idea what to expect and I wasn’t sure what ‘themed goodies’ even meant when I read that there would be extra things included each month but I was blown away by them. There was a bright red, silk, drawstring bag that caught my attention first, which contained “Vampire Blood” (or Black Cherry Tea for we humans), which I thought was absolutely adorable to include. And speaking of food, she also included some black walnut flavored Skull Shaped Sugar Cubes (perfect to pair up with that tea!). The box genuinely could have stopped there, but it kept going! There was more! There was a gorgeous Dracula quote sticker (which I am framing ASAP) which was absolutely gorgeous. So perfect to go with the box, and I love artwork that not only captures what the book is about but also is gorgeous to look at as well. And then my FAVORITE piece was hiding at the bottom of the box. The STUNNING gold spike necklace. It was so vampy and gorgeous, I took a photo (to be posted on instagram soon) with my dark red lipstick. It was amazing and I fell in love. This box was beyond anything like what I could have expected. I am so happy to be apart of it and look forward to next month? The only thing I really have to say about it that bothered me (and this is just me because I’m a weird box hoarder) is when I opened the box (and I was gentle!) half the logo came off with it! I’ll be going very slow to open next month’s as I definitely want to save one of the boxes! If you’re interested in getting your hands on a future Once Upon a Bookcase box, head over to their website and find out how! Trust me, this is one you DON’T want to miss out on.